Whether or not your home gets natural sunlight, you probably have some sort of light on during pretty much every waking moment of your day. But this Saturday, March 30, people from all over the world will take a break from that for 60 minutes to participate in the World Wildlife Fund's Earth Hour. At 8:30 p.m. local time, people are encouraged to "turn off their lights for one hour to show their steadfast commitment to protecting nature," according to the WWF's website. Here's everything you need to know about the annual event. Earth Hour first began in 2007 in Sydney, Australia, with more than 2.2 million participants, the WWF explains. Every year since then, the movement has grown, with other volunteer organizations joining WWF in promoting the annual movement. In 2018, 188 countries and territories participated in Earth Hour, and more than 17,900 landmarks and monuments even went dark for the occasion. With climate change more at the forefront than ever, 2019 is the perfect year to observe Earth Hour for the first time. The WWF has a few suggestions for how to spend the time between 8:30 p.m. and 9:30 p.m. on Saturday, including: a candlelight workout with friends; a hike (don't forget your lantern); a walk around your city to check out local sites that are participating in Earth hour (the Empire State Building, the Eiffel Tower, and the Sydney Opera House are all scheduled to go dark); a candlelit potluck; stargazing; and making a pledge to reducing your environmental impact. We all have the power to reduce our personal carbon footprints, so why not take a few moments during Earth Hour to resolve to use less single-use plastic, consume less animal products, or to travel by bike or public transportation more often? 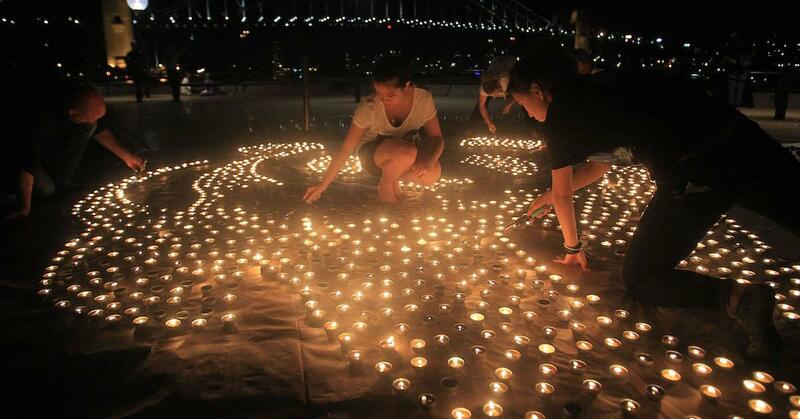 Additionally, cities all over the planet are planning events to bring people together during Earth Hour. For example, George Washington University in Washington, D.C. is hosting an event featuring acapella performances, games, other entertainment, and pizza; San Francisco restaurant Nick's Crispy Tacos is holding a candlelit dinner; Eastbourne Astronomical Society in England is inviting the public to a stargazing event; and in New South Wales, Australia, the Southern Highlands Botanic Gardens is hosting an event called Shaping a Clean Future, where participants will attempt to break the world record for the largest solar lantern display in a footprint shape. To find an event in your area, check out the map on the Earth Hour website. That said, if you are unable to make any events, or if you simply prefer to stay in on a Saturday night (same), there are plenty of ways to observe Earth Hour solo. Simply shut off your lights, and consider spreading the #EarthHour word on social media to encourage your friends to go dark at 8:30 on Saturday. From wildlife to the oceans to the forests to the straight-up future of the planet, there are so many reasons to go dark for Earth Hour.